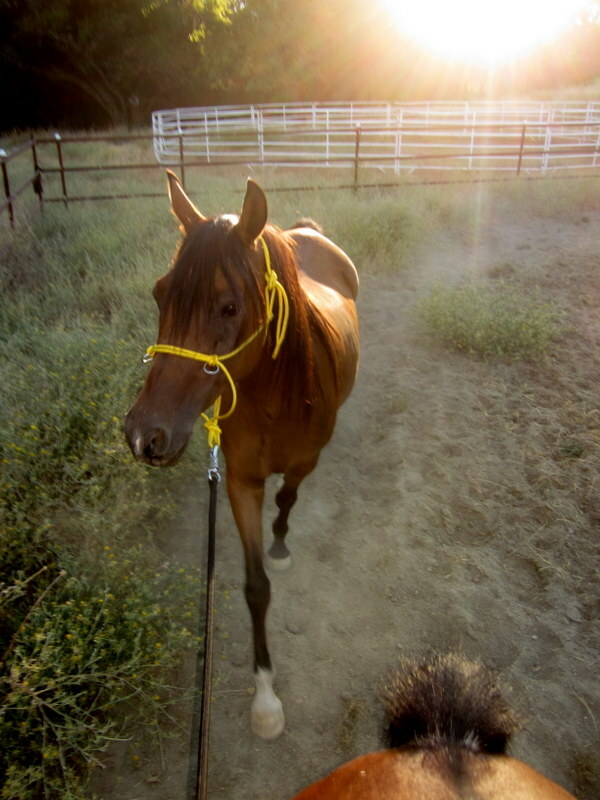 Unfazed by me riding Blaze around him in the arena, I snapped the lead rope on Joey from Blaze’s back and away we went, ponying calm as could be. Joey stopped and followed quietly and only needed one reminder to stay behind us. He and Blaze rated (meandered) well together and Joey dropped his head to graze whenever we stopped on our little “trail ride” ponying around the big pasture. I love smart Arabians. We ended by going to the other side of the property to say hello the mini and his ladies. Sheza couldn’t make baby mouth at these two studly bays fast enough..
← Don’t Forget the Bees! Joey is sure figuring things out, what a smart boy. 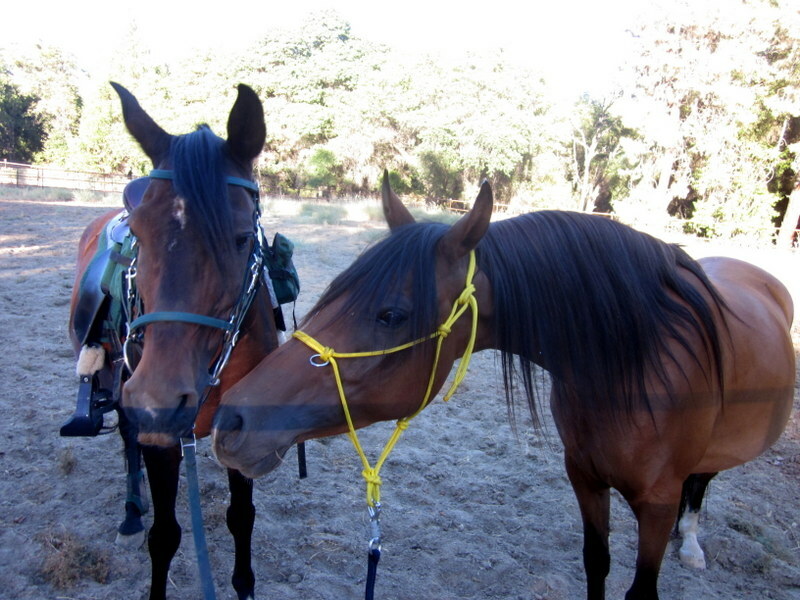 And great idea to pony, that will be a great introduction to the trails eventually. I love when they do baby mouth, it is so cute! Yep ponying is such a valuable tool especially with totally mellow leader like Blaze. He meanders really slowly and that allows Joey to go slow and eyeball everything. So far, so good! 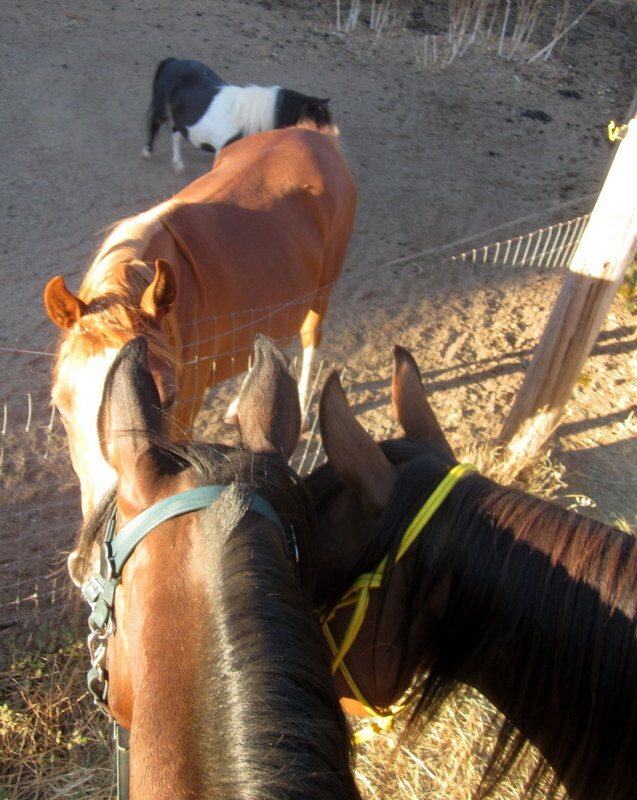 We also thought that since Joey has fears about his hind end and things behind him, he might be bothered by things above him, hence me letting him just watch me ride around first. He seemed totally okay with me being that high over his head which was a nice surprise! He also doesn't mind us leaning over his back and being on both sides that way, which is a lucky fluke considering his other issues!